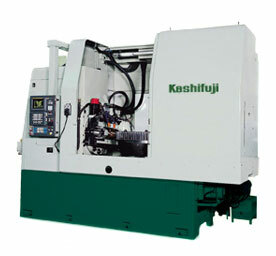 Involute Gear and Machine is the authorized distributor of Kashifuji gear hobbing machines in North America with complete sales, service, and support. 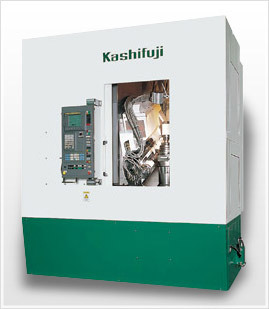 Hard hobbing removes the heat distortion in hardened gears by using carbide hobs. 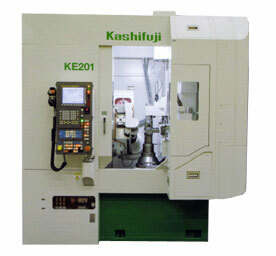 Methods - There are two kinds of Hard Hobbing processes that use carbide hobs. One is "Finish Hobbing" which finish hobs hardened gears after the initial tooth cutting. The other is "Solid Gear Hobbing" which directly hobs hardened solid gear blanks. 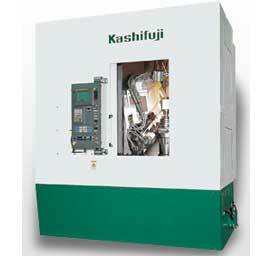 Kashifuji has developed an Auto Part Orientation Device utilizing a special noncontact sensor that quickly and accurately orientates gear teeth to the hob tool. Changing Fixtures, Hob Cutters or Workpieces (manual loading) is far simpler and faster than in a horizontal hobber as compared to a vertical hobber. 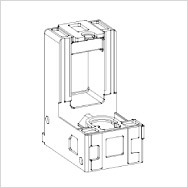 As the workpiece /fixture are positioned vertically, they are very easy to exchange and accurately mount. The Hob Head of a vertical hobber allows great accessibility to the work table/tooling area and peripheral equipment (auto loader, transfer unit etc.) can be added without reducing operability! 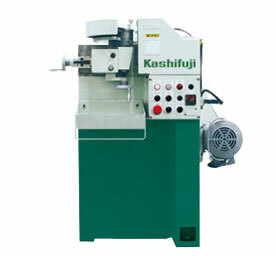 Kashifuji hand scrapes the guideways on all its hobbing machines to create a platform that dampens and absorbs the intermittent cutting forces that are inherent to hobbing process. This feature allows many years of use while still maintaining superb hobbing accuracies. 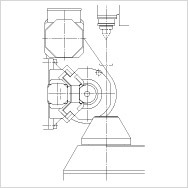 Generally, machining has limited achievable accuracies due to friction created distortions and/or internal stress relief produced during the machining process. 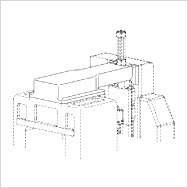 Variations of temperature and humidity during the machine process can also reduce accuracy. 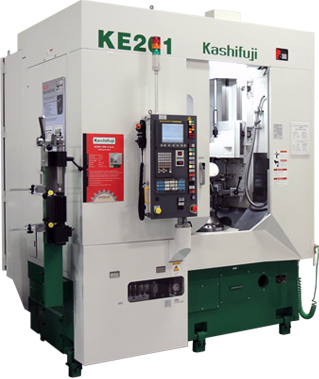 Kashifuji utilizes a hand scraped surface finish to assure highly accurate guideways that are not possible by any machining/grinding process. Hand Scraping is a finish processing method that makes the guideways extremely accurate with an ideal flatness and straightness by manually removing metal in extremely small amount (1~3 micro meters) by the use of a hand tool called a "Scraper". This hand tool has a carbide tipped single edge blade with a blunt angle. This tool is used to relieve the surface tension (create numerous, evenly distributed small, shallow dips or reliefs) in the guideway surfaces. Scraping produces a very flat surface, and the "shallow divots" retain oil which creates smooth sliding surfaces while reducing wear. Hand scraping is a labor intensive process. The guideway surfaces are painted with a dye then rubbed with a reference straight edge, the dye collects on the highspots. The highspots are then removed by hand scrapping. This process (applying dye, rubbing & scrapping) is continually repeated until approximately 30% of the guideway surface is relieved producing ~70% bearing surface. This process produces an extreme flatness. Hand scraping is referred to as a "Master's Skill". Kashifuji's skilled craftsmen are able to make accurate micro-meter scraping marks compensating for variations caused by material or temperatures changes. The "scraping pattern" produced, is often referred to as an "art form", and is unique to each craftsman. It takes many years of tedious, difficult work to acquire the experience & skill to become an accomplished Kashifuji "Scraper"
Programs are created by only inputting part gear data, hob data and cutting conditions. 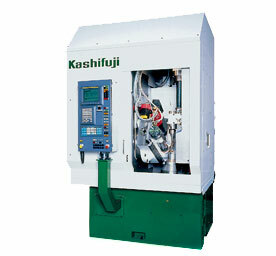 After the completion of the programs, hobbing will be automatically performed by selecting the part number. 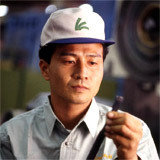 Optional crowning, relieving and/or taper hobbing cycles are easily performed. 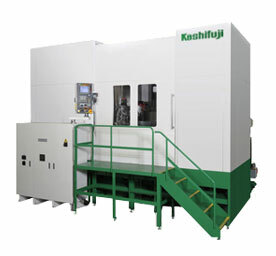 Simple and easy-to-operate hobbing programs are available for a wide variety of production situations, from mass production to special prototype hobbing. Numerous styles and types of auto loaders, conveyors or part stockers are available for automatic part transfer. All loader design are labor saving and increase efficiency. 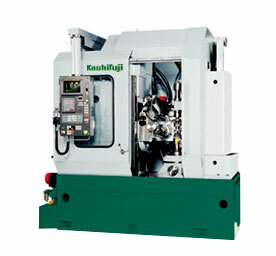 The KT50 has similar hobbing capability as the KN80. 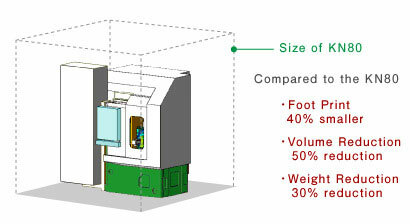 However, it has a 40% smaller foot print, volume reduction of 50% and weight reduction of 30% as compared to the KN80. 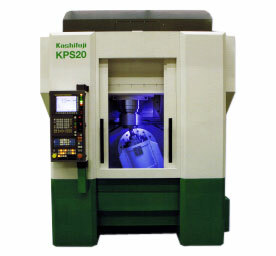 The integrated bed column and tailstock column combined with a closed-loop designed over-arm create a highly rigid machine, despite its compact size. This design allows excellent O.B.D. consistency. 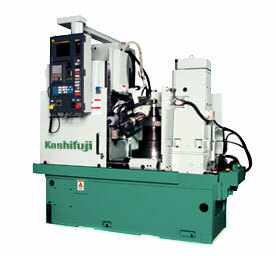 The Work Table is driven by cylindrical gears allowing 500 rpm Table speed. 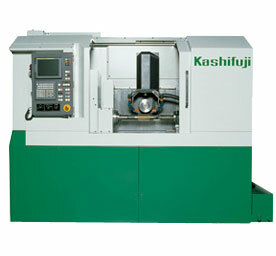 The Work Table Master Gear diameter is more than 6 times larger than the max. 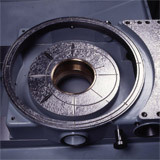 part diameter. This ratio creates a highly accurate hobbing process. Additionally, the Work Table is designed to allow great accessibility to the hob head. 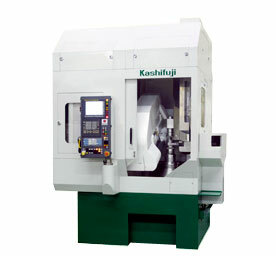 The special High Speed Loader reduces cycle time. The NC controlled 2 arm loader smoothly indexes in less than 0.3 seconds.